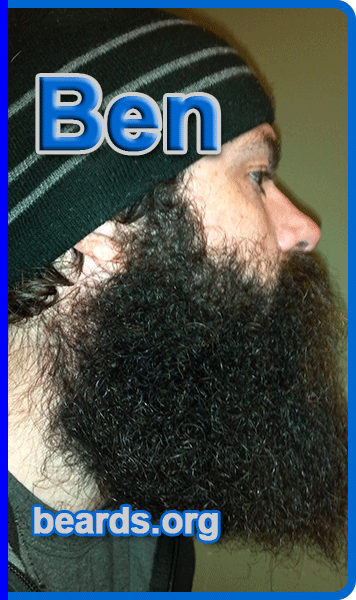 All about beards is happy to welcome Ben to the featured beards on beards.org! 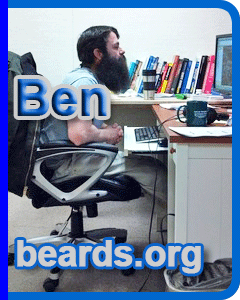 Ben first submitted some photos for the beards of the world gallery. With those photos he stated that he felt that he had a strong beard. Definitely. 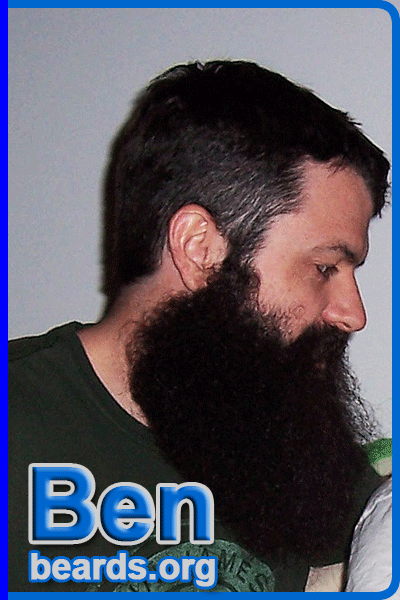 Ben has a very strong beard. And he is not afraid to grow it. 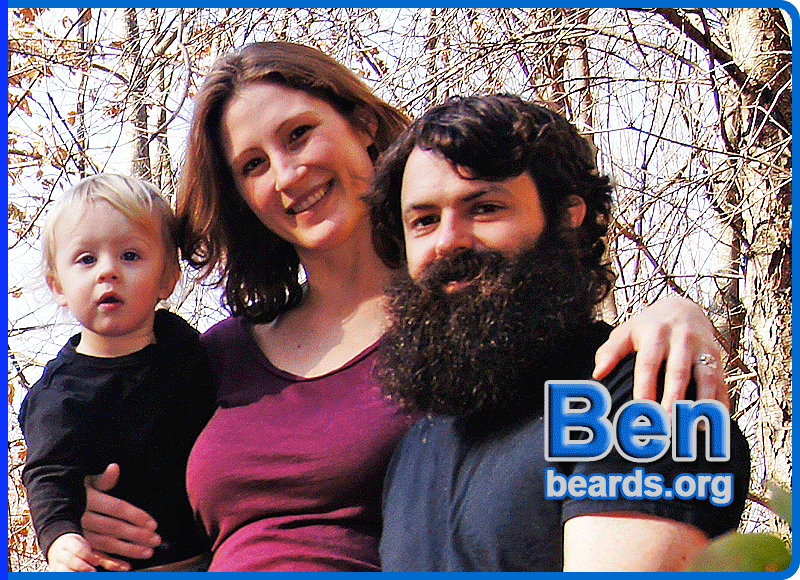 Lots of men could take a lesson from Ben when it comes to fearless beard growing! 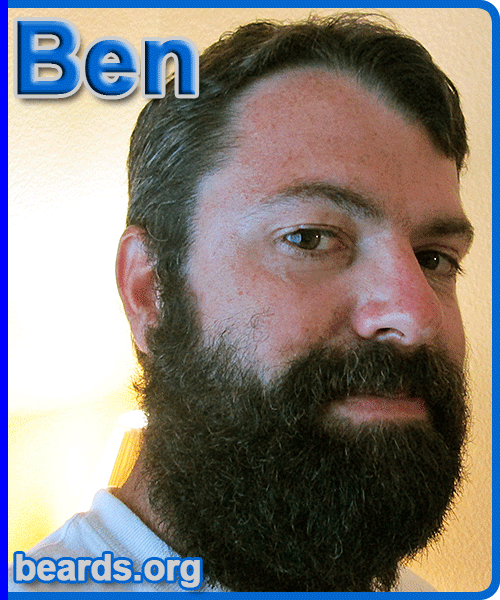 Ben is a midwestern bearded guy. His hobbies are bee keeping, mead making, canoeing, playing music, and the occasional recreational game, usually foosball or horseshoes. Ben loves spending time with his beautiful wife and two boys. He is a young business owner and has been really enjoying that experience at two years into it. The photos on this page and in Ben’s photo album are courtesy of Ben and are used with permission. All photos are subject to the site’s conditions of use. Beards are the physical expression of pride in manhood. Unfortunately, in a culture promoting skinny jeans and Bieber haircuts, growing a big, full beard is almost an act of rebellion. Consider me a rebel! I like the way my beard looks, and I love not having to shave. It certainly means a lot less than an arm or a leg does to me, but I like having it just the same. I don’t ever go long without a beard on my face. My beard says that I am my own man and I don’t care what anyone else thinks. There are plenty of beard haters out there, but they don’t deter me. There are also plenty of beard-loving kin out there. My father always had a great beard when I was growing up. When you were just a boy, did you ever think about being able to grow a beard someday? I always wanted to be able to grow a good beard like my dad had, yes. Did seeing or knowing someone with a beard influence you in wanting to grow a beard? 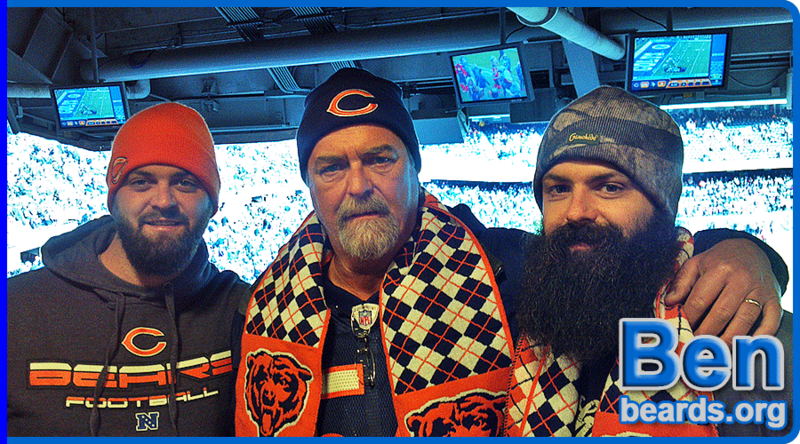 Yep, my dad was my beard inspiration. I think mine is even better than his now, though. I grew my first beard just after high school…in college. I wanted to see if I could grow a decent beard. I figured I was an adult by then so it was time to see what the beard could do. Do you feel it took some courage to grow your first beard? How about for subsequent beards? It did take a bit of courage to grow the first beard because I had no idea how it would turn out. I definitely cared more about public opinion at that young age. It was just okay from what I recall. It was good enough to make me want to grow future beards, but it was nowhere near what it is today. It was natural. It was a good fit. I remember thinking I was meant to be bearded. I shaved it off…probably in some attempt to impress a female, or based on a female’s suggestion. It wasn’t long, maybe a couple of months, before the beard returned. I haven’t gone more than a few months without one since. It was just inevitable that the beard would be back. It’s hard to keep a good beard down. Do you feel that your beard sets you apart? I do feel my beard sets me apart. I get all sorts of reactions from people I’ve never met about my beard. That’s a pretty good indication to me. You say that you are an occasional or seasonal beard grower. 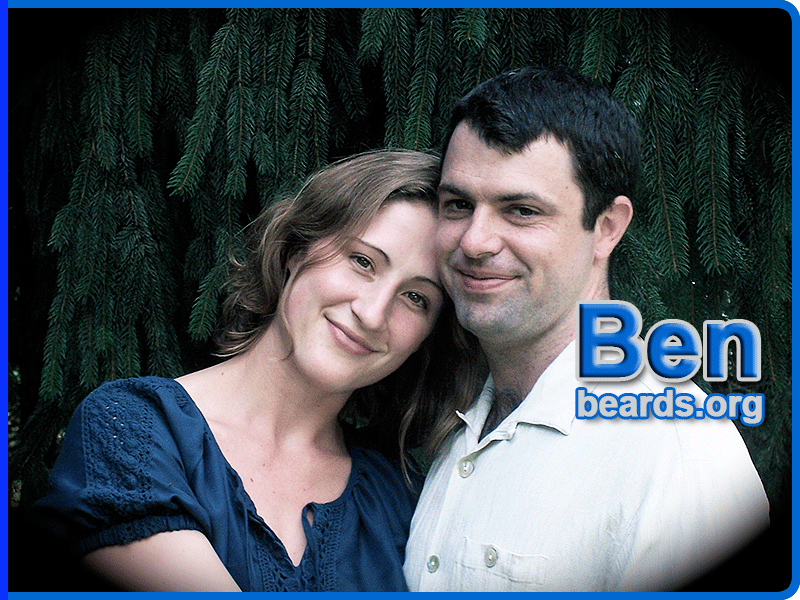 Why not be a dedicated, permanent beard grower? Sometimes I get bored and want to shave just to have a mustache for a little while or to remember what my face looks like. You’re right though. I should just have the beard for good. I think I will. The full beard is the pinnacle of facial hair growth in my opinion. Also, all the trimming and cropping that comes with other beard styles becomes a chore for me. I used to crop my beard in different ways, but I just got sick of doing that. I came to realize that I like the all-natural look the best anyway. So it’s a win-win. It looks the best and I have to do the least to maintain it. What do you think about the full beard versus other beard styles? There’s no comparison in my opinion. The full beard is where it’s at. It exists the way nature intended. It’s also the best looking. I say all guys should try the full beard at least once. I think most would feel the same way I do. Do you shape and trim the beard yourself? If so, how did you learn this skill? I don’t shape or trim my beard at all anymore. If I get rid of it, I just shave it all the way off and let it grow naturally again from the beginning. I used to shape and trim, though, and I learned that skill just through practice. There were times when I really screwed it up and had to start over with a clean slate. But I eventually got good at trimming and shaping. You recently let your beard grow out for a full year. Why did you decide to do that? It actually started as a sort of bet/competition with a friend of mine. My friend bailed after only a couple of months, but I kept it going. With my newest beard, my goal is to let it grow to terminal length. This will take some serious commitment. How was the experience of letting your beard grow out for a full year? It was fun. The reactions I got from people were crazy. I couldn’t go anywhere without some stranger making a comment to me. The comments ranged from flattering to really stupid. Eating became challenging, though. A considerable portion of my meals would end up affixed to my beard, which usually necessitated a bit of a beard shower after eating. Was that the biggest your beard has ever been? The year-long beard, or “yeard” as I called it, was the longest one to date. How did you like having your beard at this size? I liked it, but it wasn’t without its challenges. Eating is one for sure. Also, in winter I had to be careful not to zip it up in my coat. One realizes how much a beard sheds when it’s that long. This annoyed my wife. It’s not as obvious when the beard is short, I guess. What happened to the big beard and why? I shaved it off. Honestly, the biggest reason was because my youngest son, who was just a baby at the time, would grab hold of it and pull on it constantly. Now that he’s getting bigger, that won’t be an issue. So I’m letting it grow out again. What is your opinion on keeping a full beard big or huge versus keeping a full beard fairly short? I like them both. The huge beard is obviously more impressive, but I like the looks of both. The one advantage I give the huge beard is that there is no trimming or cropping involved. What is your opinion on shaping a full beard’s neck line and cheek line? As I said before, I used to always shape my beard, both neck line and cheek line. I don’t do it at all anymore. And this works fine if one is growing a longer beard. 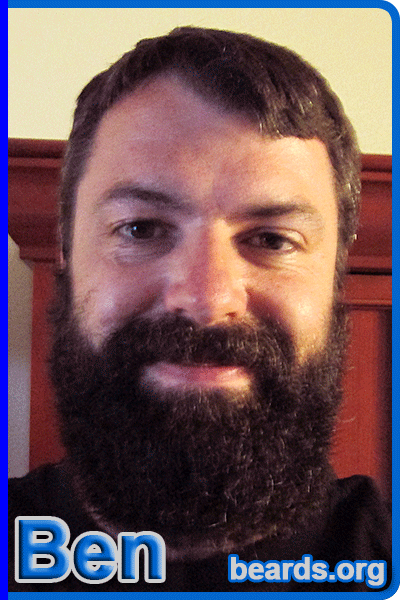 If a guy wants to keep his beard short, though, I think it looks best to keep the neck line trimmed up a bit. Otherwise, if you’re like me, you’ll look like you’re wearing a turtleneck shirt. With the long beard this just blends in at a certain length. I’m not big on trimming the cheek line at all. I think leaving that natural looks good with any beard length. Well, being a guy who likes to be bearded, it certainly helps to have a good beard. I think if my beard were weak and sparse, I probably wouldn’t grow it out. Not because of what anyone else thinks, but because I wouldn’t like the looks of it myself. Fortunately, mine is nice and full. So my beard confidence is pretty high. You stated that you feel your beard is a strong beard. When did you come to that realization and how did it make you feel? I guess I realized that when I decided to let it grow unrestricted. I was pretty happy with the results. Of course I do. I’d be lying if I said otherwise. I appreciate good beards and it’s cool to see how mine stacks up to the best ones out there. I think it rates pretty well. I do take pride in my beard, yes. You name it, I’ve heard it. I get lots of compliments, which is nice. You’ll also have the occasional fool who makes reference to terrorism or some other idiocy. I roll with it either way, though. The reactions definitely are interesting. I feel like you learn a little about a person by their reaction to a big beard. I like them, of course. They’re better than having things thrown at me. Some people seem to automatically criticize beards and call for their removal or reduction. What do you think is up with that? Oh yes, this definitely exists. I actually found it to be even more prevalent in Europe. I’m not sure where that comes from honestly, but beards are seen as some sort of oddity by a large part of modern society these days. Perhaps it’s envy. Who knows? I mean, some of the greatest minds in western history were stored inside of bearded heads….Plato, Aristotle, Di Vinci. Coincidence? I like how thick it is, and I like the dark color. The “beard-druff” is one complaint I have. The skin on my face dries out when I have a beard, and it becomes flaky like dandruff. Perhaps this always happens to facial skin, and the beard just traps it. I’m not sure. Keeping it moisturized with jojoba oil is good, but I’d rather not have to. Most of my family and friends appreciate the beard, which is pretty cool. I think my family and friends can be considered a very beard-friendly bunch. Do you see many other men around with full beards in your area? There are a few, but not many. Most guys who have beards have short beards. There aren’t any I’ve seen who have a long beard in the town I live in. Why do you think more men do not grow full beards? Probably because some have weak beards or because of job restrictions on facial hair. I also think a lot of guys don’t grow beards because they are afraid of some public perception that they may not want to be associated with, whatever that might be. I’ve even heard the objection that beards are itchy. This usually comes from guys who haven’t given the beard more than a week or two to grow. Growing a beard is only itchy for a short time, but it feels great once it gets a little length on it. I’ve learned that beards are very socially polarizing. Some people love them and some hate them, but few are indifferent about them. A guy will certainly get different treatment from some people based on being bearded or shaven. I also have learned that there is some sort of unspoken kinship among bearded men. We’re guys with beards and we just share a certain experience that non-bearded guys don’t. Absolutely! Don’t knock it until you try it. I mean, most guys don’t spend their entire lives shaving their heads if they aren’t already going bald, so why do that to your beard? Do you know if your beard has inspired anyone else to grow a beard? That I don’t know. I haven’t had anyone tell me it has. Has anyone asked you for advice on growing a beard? Oddly enough, I have been asked for beard growing advice. It’s odd because the only answer I can give is, “Stop shaving.” I figured that was pretty apparent. It’s an honor. I love having a beard and I appreciate other outstanding beards. To be featured on the website is really cool and I’m happy to contribute. I’m glad that there is a website like beards.org to highlight beards around the world. I think it’s really well done. Click on the image below to go to Ben’s photo album.